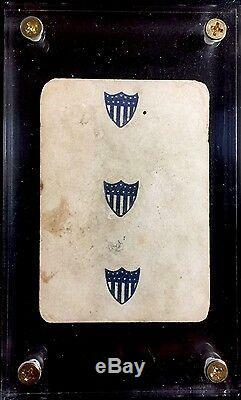 C1862 Authentic Civil War Historic Military Used Union Playing Card Single +COA. VIEW MORE IN THE STORE! 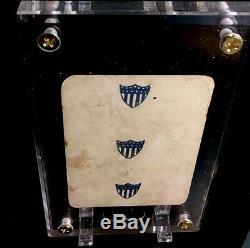 Genuine Authentic Lithographed Playing Card Historic c1862 Civil War Used Antique Single. CONDITION: (Subjective) Surface soiled from gameplay during the war/ Edge wear / Surface Wear / Surface Soiled / Surface Abrasions / Highly acceptable for its historic journey! DECK/CARD/QTY: 1 Card / Museum Quality. 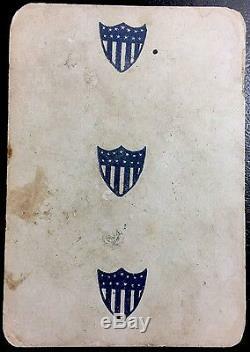 Card Back: Blue / Anchor & Shield w/ Flags. Size : 3.5"h x 2.5"w. COUNTRY: USA , 14 Chambers St. PRINTER: The American Card Company: operated by Benjamin W. Hitchcock, owner of a music and publishing business at 14 Chambers street NY. (The business consisted of sheet music, books, musical instruments, printing presses, and type). This incredibly rare Civil War Suited Pip single is highly collectible. This Historic artifact is a must own for serious collectors. 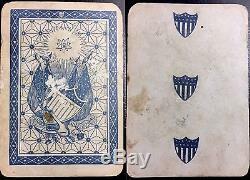 Owning a complete set of Civil War period playing cards from this set was designed with an eagle, star, shield, and flag artwork in lieu of the more traditional suits. The Jack and King are represented by officers and the Queen by Goddess or Lady Liberty. 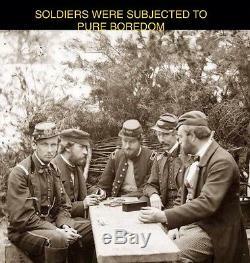 In between combat, marching, mess, drill, and sleep, Civil War soldiers had plenty of idle time to fill. They would occupy their time with leisure activities such as singing, writing letters, attending religious services, and playing games. BOX TITLE (Not Included) Reference only. Three versions of the Union Cards were made especially for Americans. 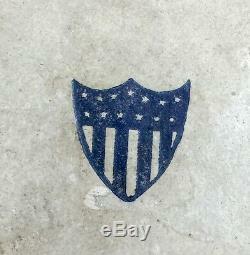 This was conveyed through the following message on the Union Cards box,'THE AMERICAN CARD CO. Confident that the introduction of NATIONAL EMBLEMS in place of Foreign, in PLAYING CARDS, will be hailed with delight by the American People, take pleasure in presenting the UNION PLAYING CARDS. 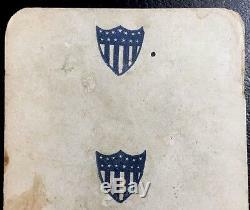 As the first and only Genuine American Cards ever produced, in the fullest confidence that the time is not far distant when they will be the leading Card in American market. 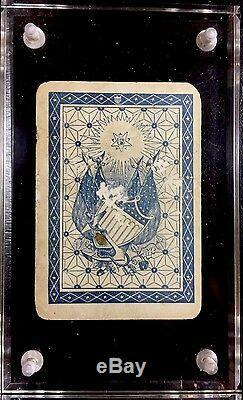 The Union Cards are calculated to play all the Games for which the old style of Playing Cards are used. The suits are EAGLES, SHIELDS, STARS, and FLAGS, GODDESS OF LIBERTY in place of Queen, COLONEL for King, MAJOR for Jack. 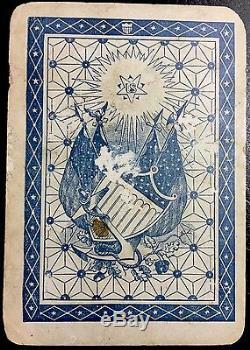 In playing with these Cards, they are to be called by the names the emblems represent, and as the Emblems are as familiar as household words, everywhere among the American people, they can be used as readily the first occasion as Cards bearing Foreign emblems. The historic card will be protected in a ultra violet 1/2 inch thick screw down shelf stable protected case ready for display. This is a true piece of history as each card does tell a story and also proves that owning such a magnificent artifact is truly remarkable for any collector! This spectacular investment example is only one reason why to own such a piece that's rich in history. Now you can own one historic card with pure confidence and having the luxury of displaying a historic time piece that's rich in American history! Please subscribe now for our newsletter to the greatest card store as we are adding daily and offering huge weekly discounts to subscribed Ebayers! Collecting playing cards can be a very rewarding hobby. There is the excitement of the hunt for new rare cards, whether through collectors' meetings, internet auctions or at shows and flea markets where every new table may unfold the unexpected treasure. Even better, there is the enjoyment of fellow collectors, some of the most interesting people in the world! Playing Cards New York Playing Cards Merger Unopened Bicycle Decks Naipes Naypes Naypos Sealed Decks USPCC Congress Whist books hoyle patience Arrco Dougherty Tobacco Cards Spelkort, Naipes Triplicate, Bee, 18th Century french France, SWAP, Swap stamp Spielkarten Spillekort Cartea da gioco magic decks casino cards worlds Fair Speelkaarten Swap Cartas deJogar Scarce Rare Limited Museum, Mogul, Pelikorit Dondorf Squeezers Bridge Hochman Cards Cribbage, Le Normand Cards, Tarot, Fortune Telling, B. We pride ourselves on our customer service. You may also be interested in.... 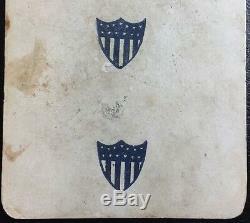 The item "C1862 Authentic Civil War Historic Military Used Union Playing Card Single +COA" is in sale since Thursday, February 8, 2018. This item is in the category "Collectibles\Militaria\Civil War (1861-65)\Original Period Items\Other Civil War Original Items". 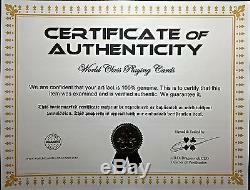 The seller is "worldclassplayingcards" and is located in Slippery Rock, Pennsylvania. This item can be shipped worldwide.